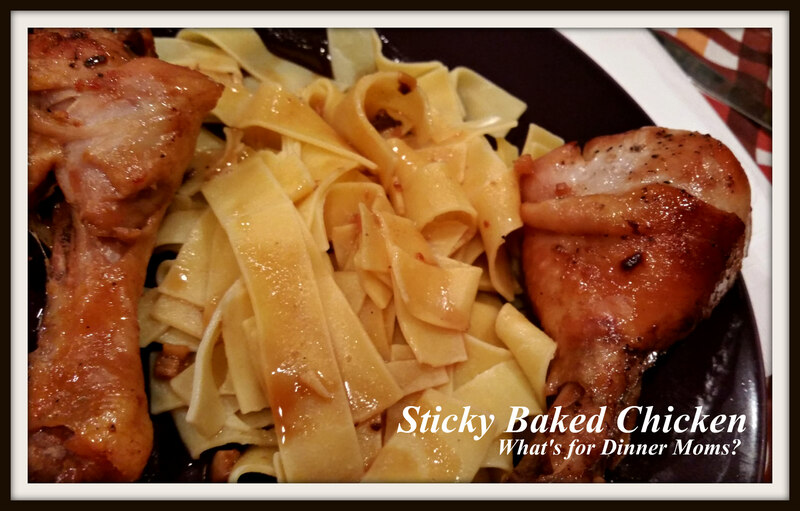 Sticky Baked Chicken – What's for Dinner Moms? After the mess the other night things are now back on track. I had my daughter make the chicken to prove that mistakes happen and we move on. They are not permanent. She did a great job. We were at Western Michigan University yesterday and the kids saw two take-out delivery trucks stopping at the dorms. Both kids began listing the foods they can make or cook so that they will not have to spend their money on delivery. It warmed my heart! My family really liked the chicken. This dish was super simple to make – 5 ingredients. It takes about an hour to bake but 5 minutes to put together. They all liked how the flavor was through the chicken not just on the outside. I had originally planned on serving this dish with rice but we were all out and I refused to go to the store. We had Amish egg noodles on hand so that is what we had for dinner with green beans. Preheat oven to 350 degrees. Prepare a 13 x 9 casserole dish (or a rimmed baking sheet) with aluminum foil covering. Place chicken in bottom of pan. Sprinkle both sides with salt and pepper. Mix together honey, soy sauce, ketchup, and garlic. Pour over chicken. Bake for 40 minutes. Raise heat to 425 degrees and continue baking for an additional 15-20 minutes until chicken has browned and sauce thickens. I just found a great sale on drumsticks, so the timing of this recipe is perfect! Thanks! I buy them when they are $.87 or less a lb. My family eats too much meat and I like that they are “portioned” for the kids. I think I am going to try this for wings this weekend! Thanks! Let me know how it is with wings. Pingback: Sticky Baked Chicken — What’s for Dinner Moms? – Attempting Life! So glad it was a better day! We all have those days and it’s good to keep trying so it’s awesome your daughter got back in there! This sounds great! Thanks! Congratulations to your son on States! Thanks, I read your post yesterday on my phone and could really relate! Sticky yummy good! I love noodles with meat of any kind. Glad you are back on track! Thanks! It was a brief turn.